3 ISHMAN, Benjamin Bernard b: 27 Sep 1824 in Northumberland.Co.PA d: 25 Apr 1903 in Auburn home, Auburn.Twp, Fay.Co.IA Burial: Oak Ridge Cem, row 4, lot 72, Auburn, Fay.Co.IA. Note 5: Oldest of 6 ch; 1903, 3 bro still in PA Note 7: 1857 PA to Auburn area farm, Fay.Co.IA Note 9: 1860 Census; farming, Windsor.Twp, Fay.Co.IA Note 11: Abt. 1863 Enlisted Co. F, 7th IA Cav. Served on the frontier, i.e. Dakota territory. Note 12: Indian battle, 26 cav died, wounded & injured when thrown from horse, never fully recovered. Note 13: A bro in same Cav Co in SD, 1 of 26 killed in Indian battle. Note 15: Aft. 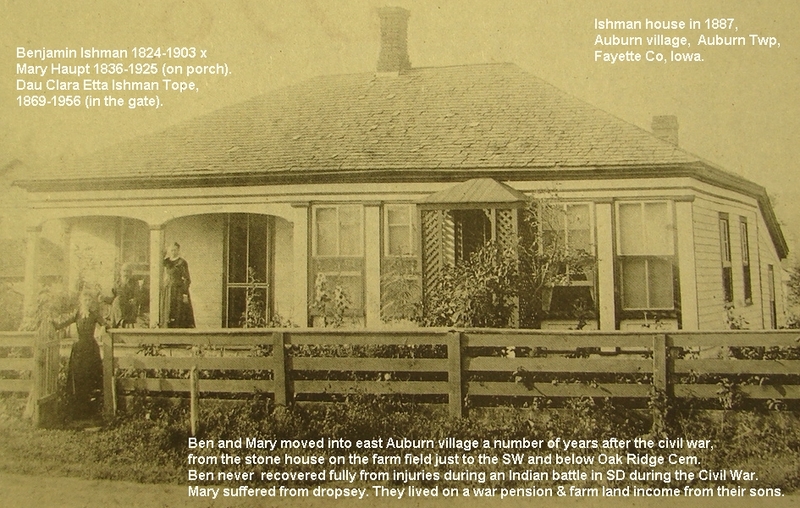 1866 Moved from stone house on field SW of cem to frame home in Auburn village. 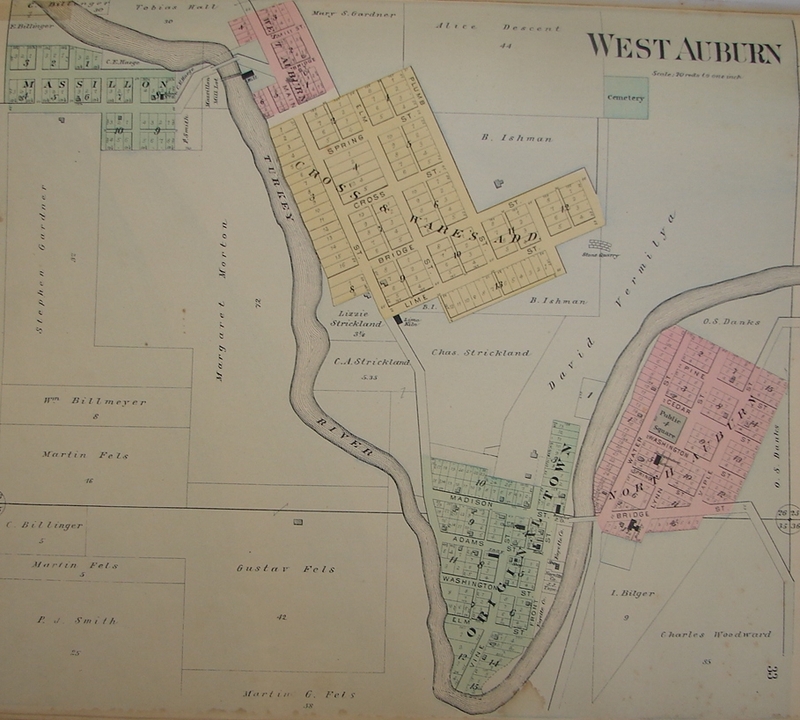 Note 22: 1880 Census; farming, Auburn area, Auburn.Twp, Fay.Co.IA. Note 24: 1885 Census; farming in SW1/4 of NE1/4, sec 26, Auburn.Twp, Fay.Co.IA. Note 27: 1896 Plat: 12a in SW1/16 sec 26, 33a NE1/4 of SE1/4, sec 27. Note 28: 1896 Plat: home & abt 20a, sec 26, just SW of Oak Ridge Cem. Salt River flowage in NE Missouri and Fayette County in NE Iowa. Colored rows = info/data updated; white rows = not updated, needing data. 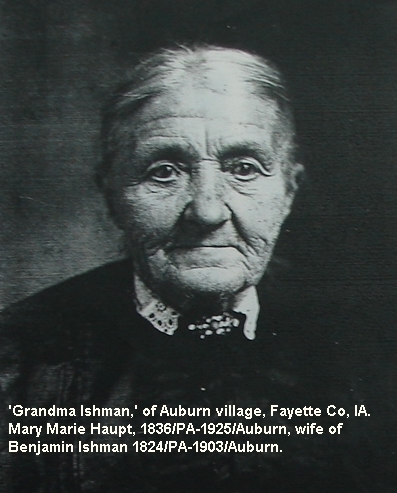 Ishman James Benjamin Ishman Lula Hoyt 1886/Auburn.Twp-1933/Independence 1st; 2nd Mabel Olson 1901/MN-1985/Fayette. 4 Oct 1887 10 Mar 1968 Hawkeye Hawkeye Lot 541. Son of John Lewis Ishman 1860/Windosr.Twp-1949/Fay.Co & Mary Almira Bemis 1864/Aubutn.Twp-1943/Fay.Co. Ch 1st: Ida Mae. Ishman Mabel Dorothea Olson Ishman James Benjamin 1887/Auburn-1968/IA, 2nd wife 3 Jul 1901 18 Aug 1985 Hawkeye Hawkeye Lot 541. Dau of Andrew Olson & Emma Sandquist. Ishman Bernard Benjamin Ishman Haupt Mary Marie 1836/PA-1925/Auburn.Twp 27 Sep 1824 25 Apr 1903 Oak Ridge Auburn Twp Row 4. Lot 72. Son of David Ishman 1798/PA-1963/PA & Cartherin Rough 1802/PA-1861/PA. Ch: Sarah Ann, Nelson, Mary A, Hiram, John Lewis, Clara Ette. Ishman Mary Marie Haupt Ishman Bernard 1824/PaA-1903/Auburn.Twp 11 Oct 1836 13 Mar 1925 Oak Ridge Auburn Twp Row 4. Lot 72. Ch: Sarah Ann, Nelson, Mary A, Hiram, John Lewis, Clara Ette. Ishman Oral Mae Roberts Ishman Albert 1889/Auburn.Twp-1855/Fay.Co, 1st wife 1896 Apr 7, 1924 Waucoma Cem Waucoma Ch: Alberta Oral, Harvey Lewis, Allen Garth, Shirley May. Ishman Albertus Albert Allen Ishman Roberts Oral M 1896-1924, 1st; 2nd, Wilbur Ellen ?-1956 1889 1955 West Union West Union Son of John Lewis Ishman 1860/Windsor.Twp-1949/Fay.Co? & Mary Almira Bemis 1864/Auburn.Twp-1943/Fay.Co? Ch 1st; Alberta Oral, Harvey Lewis, Allen Garth, Shirley May. Ch 2nd; Lawrence Robert. Ishman Clarence Edwin Ishman Cristensen Marie K 1898-1973 1893 1954 West Union West Union Son of John Lewis Ishman 1860/Windsor.Twp-1949/Fay.Co? & Mary Almira Bemis 1864/Auburn.Twp1943/Fay.Co? Ch: Mildred Irene, Clarence Laverne, Adaline M.
Ishman Clarence Laverne Ishman Hanson Lorraine LaVon b. 1925 Sep 23, 1920 No date West Union West Union Son of Clarence Edwin Ishman 1893/Auburn.Twp/1854/Fay.Co.? 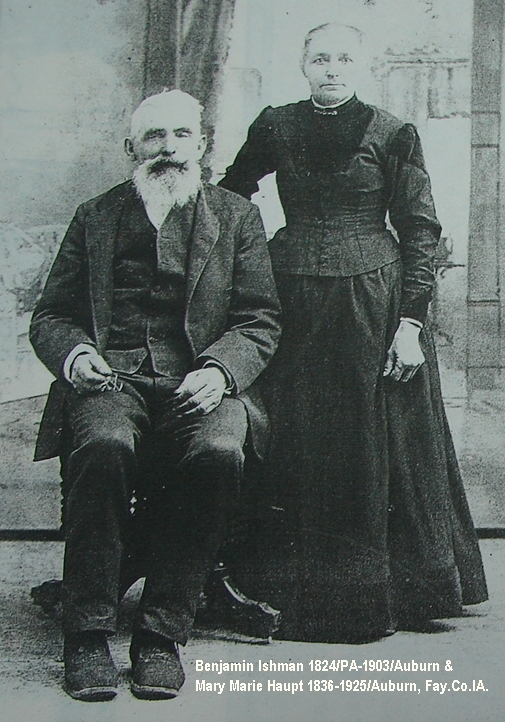 & Marie K. Christensen. Ch: Larry Wayne, Ronald Laverne, Kantey Lynn. Ishman Eldon Isham Ishman son of Wm Henry Jan 30, 1943 Jul 8, 1956 West Union West Union F3-9-6. Son of Wm Henry Ishman 1894/Auburn.Twp-1946/Cresco & mabel Josphine Wentworth 1900/Cresco-1997/Cresco. Ishman Ellen A Wilbur Ishman Albert 1889/Auburn.Twp-1855/Fay.Co, 2nd wife 1891 Mar 11, 1956 West Union West Union F3-8-4. Ch: Lawrence Robert. Ishman Henry Milton Ishman Wyman Mary Margaret Elizabeth 1875/Oelwein-1937/Fay.Co. 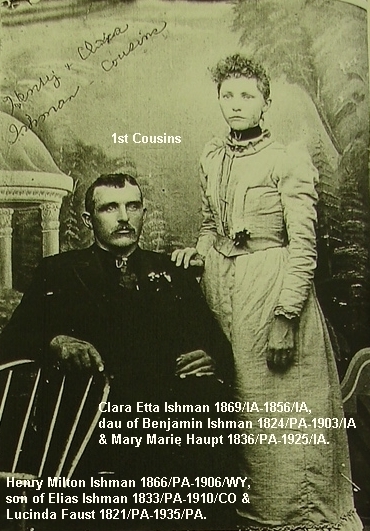 6 Mar 1866 2 May 1906 West Union West Union Son of Elias Eli Ishamn 1833/PA-1910/CO & Lucinda Faust 1832/PA-1935/PA. Nephew of Ben Ishman 1824-1903 of Auburn. Birth possibly 1863, bz/2010. Ch: William Thomas, Edward, Harold M, infant. Ishman John Lewis Ishman Bemis Mary Almira 1864/Auburn.Twp-1943/Fay.Co Aug 19, 1860 Apr 16, 1949 West Union West Union Son of Benjamin Bernard Ishamn 1824/PA-1903/Auburn.Twp & Mary Haupt 1836/PA-1925/Auburn.Twp. 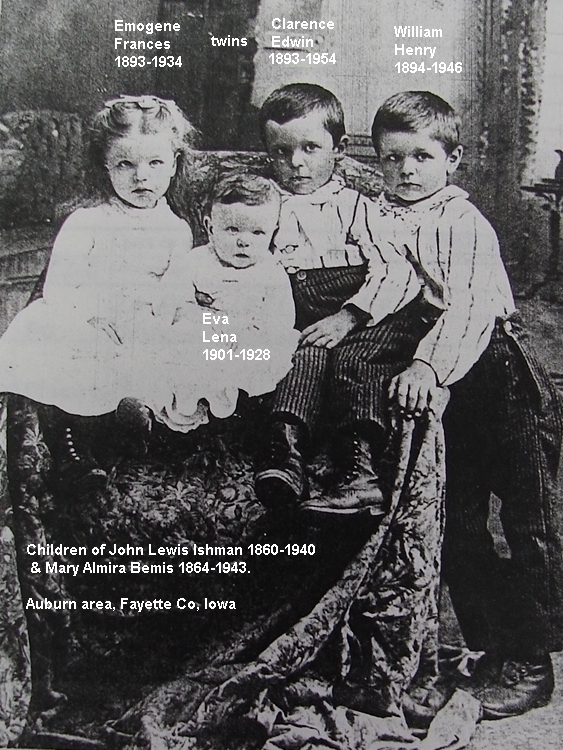 Ch: James Benjamin, Albertus Allen, Etta Jane, Clarence Edwin, Wm Henry, Imogene Frances, Eva Lena. Ishman Mary Margaret Elizbeth Wyman Ishman 1866/PA-1906/WY 15 Jun 1875 3 Aug 1937 West Union West Union Dau of Thomas C. & Eliza Wyman. Ch: William Thomas, Edward, Harold M, infant. Ishman Marie K Christensen Ishman Clarence Edwin 1893/Auburn.Twp-1854/Fay.Co? 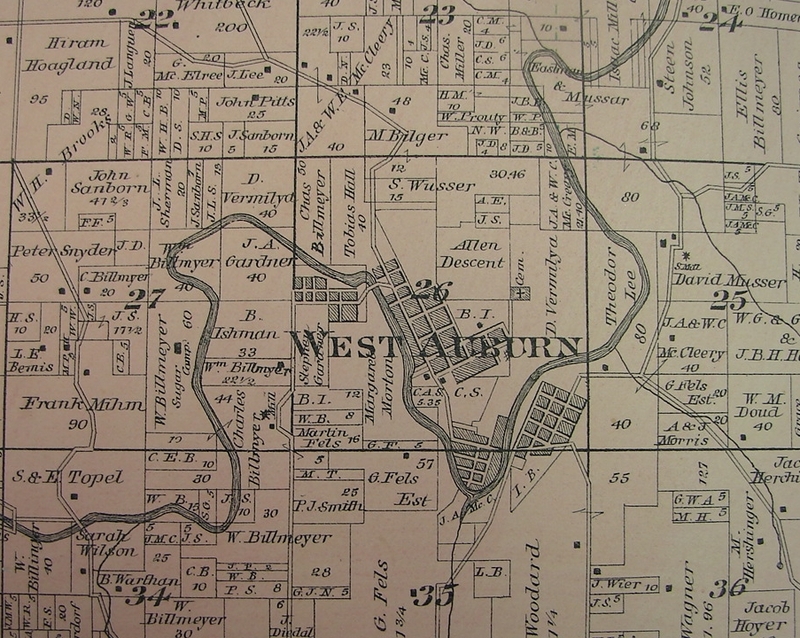 1898 1973 West Union West Union Ch: Mildren Irene, Clarence Laverne, Adaline M.
Ishman Mary Almira Bemis Ishamn John Lewis 1860/Windsor.Twp-1849/Fay.Co May 14, 1864 Aug 23, 1943 West Union West Union Dau of James Nelson Bemis 1826/NY-1888/Bremer.Co & Emeline W. Farwell 1829/NY. 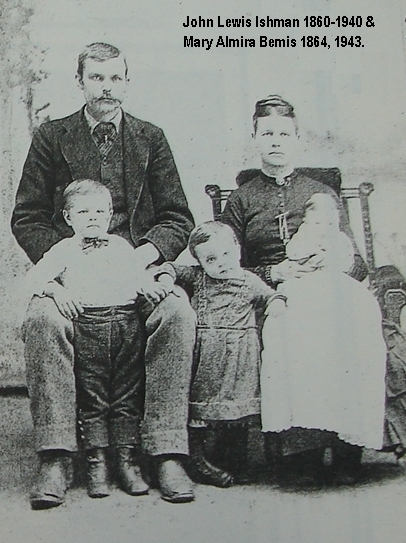 Ch: James Benjamin, Albertus Allen, Etta Jane, Clarence Edwin, Wm Henry, Imogene Frances, Eva Lena. Ishman William Henry Ishman Wentworth Mabel Josephine 1900/Cresco-1997/Howard.Co Sep 8, 1894 Sep 24, 1946 West Union West Union WWI. Son of John Lewis Ishman 1860/Windsor.Twp-1849/Fay.Co & Mary Almira Bemis 1864/Auburn.Twp-1943/Fay.Co. Ch: Donald Sherman, Joyce, Darlene Lois, Dale Albert, Eldon Gene. Wm Henry and wife Mabel Wentworth are buried at Oak Lawn Cem in Cresco, bz/2010. Basic descendent tree of the major Ishman line in Fayette Co, Iowa. I had to re-create the tree from online, census, burial info so there will be speculations/best guesses. The tree can be added too or corrected should anyone want to copy/paste/email info. ..... +WILLIAMS, Alfred A. b: 08 Jan 1870 in Fay.Co.IA d: in Fay.Co.IA Burial: Oak Ridge Cem, Auburn.Twp, Fay.Co.IA m: in Fay.Co.IA.
. 4 ISHMAN, John Lewis b: 19 Aug 1860 in Windsor.Twp, Fay.Co.IA d: 16 Apr 1949 in Fay.Co.IA? Burial: West Union Cem, Fay.Co.IA. Note 11: 1900 Census; farming, Auburn.Twp, Fay.Co.IA. Note 12: 1903 On home farm near Auburn, Fay.Co.IA. ....... +HOYT, Lula Julia b: 30 Nov 1886 in Auburn area, Auburn.Twp, Fay.Co.IA d: 06 May 1933 in St. Hosp, Independence, Buchanan.Co.IA Burial: Oak Ridge Cem, row 3, Hathaway plot, Auburn, Fay.Co.IA. m: Dec 1907 in Fay.Co.IA. Father: William M. HOYT Mother: Edith Ida HATHAWAY Note 9: Divorced from James Ishman. ... 5  ISHMAN, Albertus Albert Allen b: 06 Feb 1889 in Auburn area, Auburn.Twp, Fay.Co.IA d: 09 Feb 1955 in West Union, Fay.Co.IA? Burial: West Union Cem, Fay.Co.IA. .... 6 ISHMAN, Lawrence Robert b: 07 Mar 1929 in Fay.Co.IA Burial: Will be at West Union Cem, Fay.Co.IA. ........ +UNKNOWN, Donna L. b: 1932 Burial: Will be at West Union Cem, Fay.Co.IA. ... 5 ISHMAN, Clarence Edwin b: 02 Feb 1893 in Auburn area, Auburn.Twp, Fay.Co.IA d: 23 Mar 1954 in Fay.Co.IA? Burial: West Union Cem, Fay.Co.IA. .... 6 ISHMAN, Clarence Laverne b: 23 Sep 1920 Burial: Will be at West Union Cem, Fay.Co.IA. ... 5 ISHMAN, William Henry b: 08 Sep 1894 in Auburn area, Auburn.Twp, Fay.Co.IA d: 24 Sep 1946 in Howard.Co.IA Burial: Oak Lawn Cem, Cresco, Howard.Co.IA Note 9: Served in WWI. .... 6 ISHMAN, Eldon Gene b: 30 Jan 1943 in Iowa d: 08 Jul 1956 in Fay.Co.IA Burial: West Union Cem, Fay.Co.IA.
. 4 ISHMAN, Clara Etta b: 05 Aug 1869 in Auburn, Auburn.Twp, Fay.Co.IA d: 16 May 1956 in Fay.Co.IA Burial: West Union Cem, Fay.Co.IA Note 9: 1903 Living at Auburn, Fay.Co.IA. ........ +POPENHAGEN, Lucille b: 09 Dec 1919 m: 03 Feb 1941 in Fay.Co.IA. 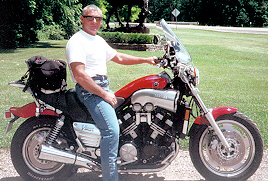 ......... +EARLE, Richard b: 21 Aug 1946 in Fayette, Fayette Co, IA m: 09 Jan 1965 Father: Harold T. EARLE Mother: Mildred Elizatbeth OSTRANDER Note 2: Lived in Grundy Center, Iowa. 3 ISHMAN, Frederick b: 1826 in Northumberland.Co.PA d: Bet 1864-1865, Indian battler in SD. Burial; Would have been on the field of battler in SD. Note 9: 1860 Census; farming with bro Ben's family, Windsor.Twp, Fay.Co.IA. Note 11: Abt. 1963; Enlisted Co F, 7th IA Cav. Served on the frontier, i.e. Dakota territory. Note 12; Speculate bro's Ben & Fred served in SD together, bz/2010. Note 13; Bet 1864-1865 Fred was 1 of 26 killed in Indian battler were Ben was wounded.
. 4 ISHMAN, Henry Milton b: 06 Mar 1866 in Spring Cr, Elk.Co.PA d: 02 May 1906 in RR accident in Wyoming Burial: West Union Cem, Fay.Co.IA. 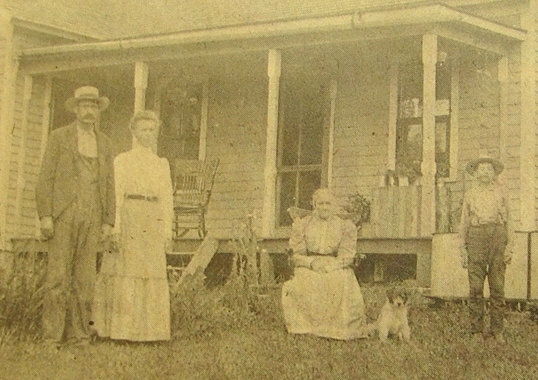 Note 8: 1880 Census; farm hand, with parents, Spring Cr, Elk.Co.PA. Note 10: Bef. 1895 PA to join uncles/cousins Windsor.Twp, Fay.Co.IA. Note 11: 1895 Census; farming, Windsor.Twp, Fay.Co.IA. Note 12: 1900 Census; ice man for RR, Oelwein, Fay.Co.IA Note 14: Aft. 1895 RR car repairman, Oelwein, Fay.Co.IA. Note 17: Abt. Jan 1906 Unemployed from RR, needing work. 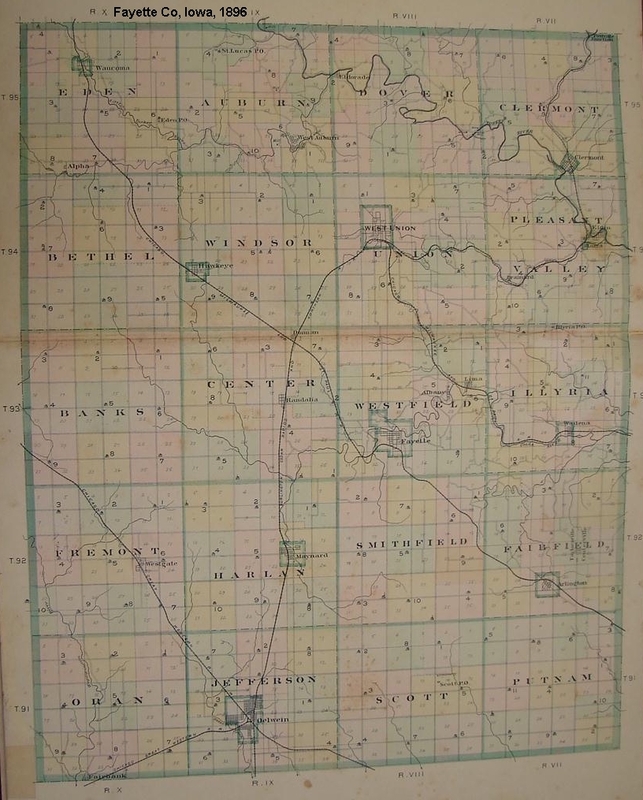 Note 18: 12 Apr 1906 Left Oelwein, headed west looking for work. Note 19: 25 Apr 1906 Wrote wife from Rawlins, WY, heading farther west. Note 21: 02 May 1906 Ran over by RR cars, Rawlins Camp of Woodmen, WY. ..... +WAYMAN, Mary Margaret Elizabeth b: 15 Jun 1875 in Oelwien, Fay.Co.IA d: 03 Aug 1937 in Fay.Co.IA Burial: West Union Cem, Fay.Co.IA. m: Abt. 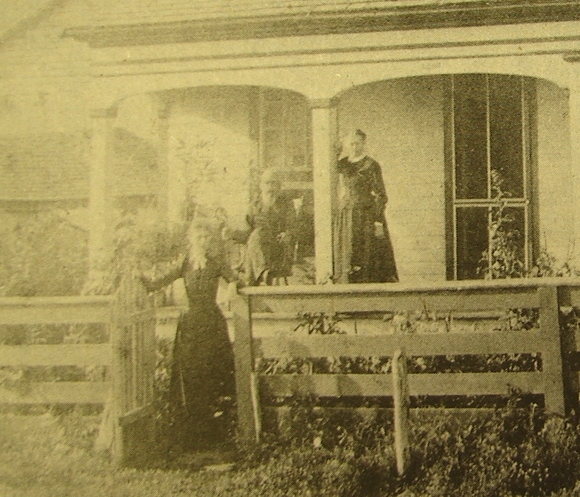 1895 in Oelwein, Fay.Co.IA Father: Thomas C. WYMAN Mother: Eliza UNKNOWN Note 9: From Oelwein at time of marriage. 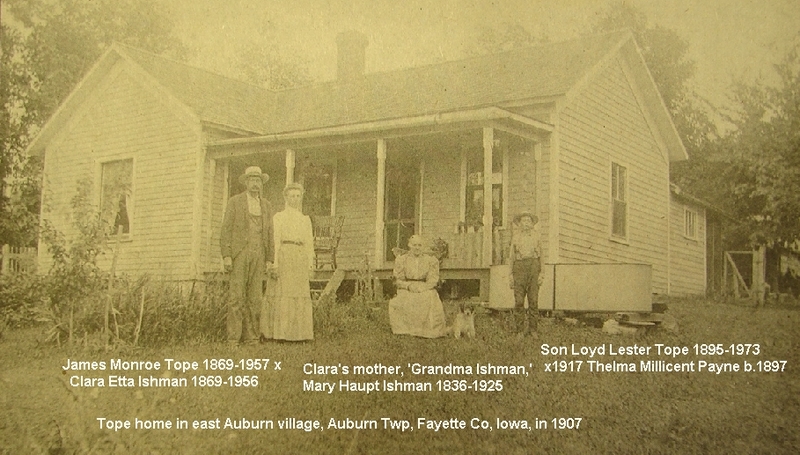 Note 11: 1901 Mother living in West Union, Fay.Co.IA. ... 5 ISHMAN, Unnamed Infant b: Abt. Jun 1901 in Oelwein, Fay.Co.IA d: 05 Jul 1901 in Oelwein, Fay.Co.IA Burial: Woodlawn Cem, Oelwein, Fay.Co.IA. Note 8: 10 Jul 1901 Oelwein paper; Henry Ishman infant dies, buried here. Henry Milton Ishman was a nephew of Benjamin Ishman and apparently the only Ishman not on the Benjamin line to settle later on in Fayette Co, Iowa. 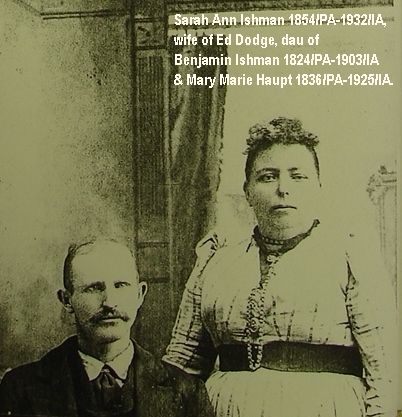 Benjamin had a brother Frederick Ishman that I speculate came to Iowa with Ben. If correct, they joined the Calvary together. Fred was killed in the same Indian battle in SD that 26 of the Calvary unit were killed and where Ben was wounded and injured. Do not trust as totally valid any tree/report data. Often World Connect or Ancestry trees/data was utilized as a foundation upon which to add material gleamed from obits, articles, histories, biographies, stories, burials, censuses and other data collected. My primary interest is generally the pioneer history and includes linking village and neighborhood surnames together for several of the early generations. Family connections, locations and other data may have to be speculated in order to continue a complex series of inter-related projects. My web pages are primarily personal study projects for note keeping, but can also jump start others. I have a huge number of projects started and rarely return to edit/update material unless interest is rekindled. Any web pages online are usually linked off the 'Index Page.' Numerous projects are not put on web pages but are in draft form or in the form of photo albums on the 'Photo Hosting Site.' I may have material for research use in storage, plus will/can upload other people's material if appropriate. Any reproduction of this site or it's contents requires express written consent.